It’s been awhile since I had the pleasure of trying anything from Gorvett & Stone. I remember falling in love with their chocolates a long time ago and I’ve been recommending them to people for almost a decade. Their chocolates when I last had them were delicious including my favourite – Valrhona’s salted caramel diamonds. Amazing! This time they pinged me and asked if I’d like to try one of their Easter Eggs and how could I say no? 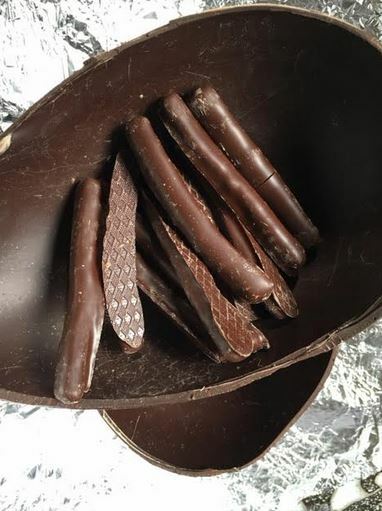 Opting to use ethical Valrhona chocolate, these Easter Eggs are guaranteed free of child slave labour cocoa and that means that whether for yourself or a family member, buying them helps farmers who practice good ethical farming practices. The egg they chose to send me was one my husband will thank them for because it was a dark 70% chocolate orange egg with chocolate covered candied orange batons inside it. The box is gorgeous, make of cardboard so it can be recycles and foil is kept to a minimum. The ribbon begs to be reused and the whole packaging of the egg is thoughtful for the consumer and environment. Despite postal handling mine arrived perfectly. The egg itself was lightly infused with orange so that the genuine orange flavour came through without being bitter (with too much pith) and balanced just perfectly against the 70% dark Valrhona chocolate. The dark chocolate is such high quality it isn’t bitter despite being dark and the orange doesn’t really sweeten it too much. The batons inside are perfectly made with a delicious slathering of dark chocolate over the generous lengths of peel inside. The perfect marriage of dark chocolate and candied orange. For the chocolate orange lover, this is perfect. For my diabetic husband, this was the perfect egg. It might have taken him over a week to demolish it but he enjoyed every piece – as will you. 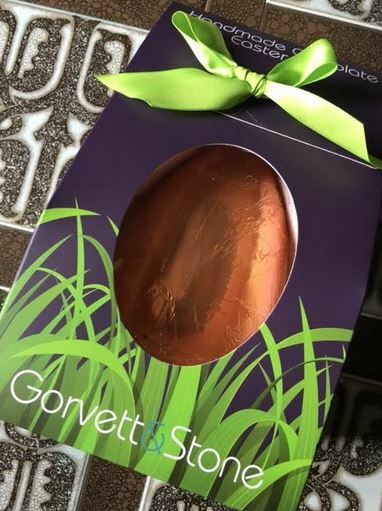 This egg is available from Gorvett & Stone in their shop or online. Buy one now! I reviewed some of their goodies – including their excellent boxed selection – a couple of years ago, and they were all delicious. Good to hear this is still the case – I must revisit their webshop sometime soon!